Home » Baseball » Baseball Cards » What Are the Top Selling 2012 Bowman Baseball Cards? 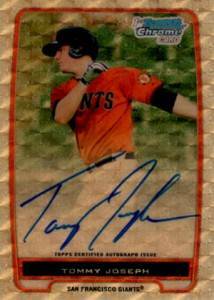 What Are the Top Selling 2012 Bowman Baseball Cards? It's rare in the hobby that a low- to mid-end product can command high single card prices out of the gate. But that's exactly what 2012 Bowman Baseball has done. Its traditional mix of Refractor rainbows and a strong prospect checklist have combined to see several huge early sales. During its first official week on the market, 11 2012 Bowman Baseball cards have sold on eBay for four figures. While it may be hard to judge an overall product based on the sales of one-of-one cards and others with miniscule print runs, 2012 Bowman Baseball has so many of them. This is giving collectors a better-than-normal chance of hitting something huge given the initial price point. 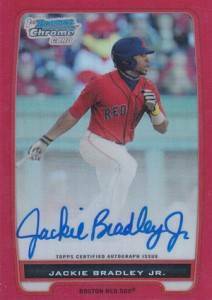 Superfractors have become the benchmark by which all modern prospect and rookie cards are measured. 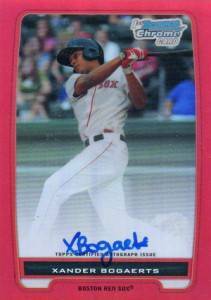 With lots of great prospects and rookies in the set this year, it will likely mean that collectors will continue to hear about 2012 Bowman Baseball for years to come as the prospects move up the minor league ranks and into the majors. 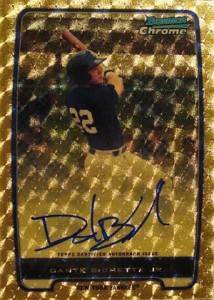 The highest-selling 2012 Bowman Baseball card recorded on eBay so far is a Dante Bichette Jr. Superfractor Autograph. The one-of-one featuring the Yankees prospect (and son of the former Rockies slugger) went for $2,500. Another Superfractor Autograph, Tommy Joseph of the Red Sox, sold for $1,535. 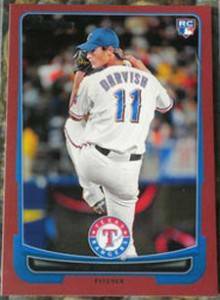 After the Bichette Superfractor, the list of hot 2012 Bowman Baseball cards is dominated by Yu Darvish. The Rangers rookie accounted for ten of the 15 top opening week sales. 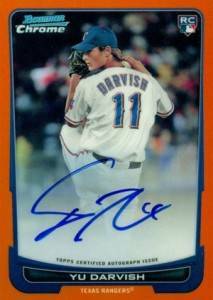 Limited to 25 autographed copies, a pair of Yu Darvish Orange Refractors topped the $2,000 mark ($2,325 and $2,250). His more plentiful Gold Refractor Autographs, which are numbered to 50, were also very hot. Six sold on eBay last week with prices ranging from a low of $1,250 to a high of $1,599. 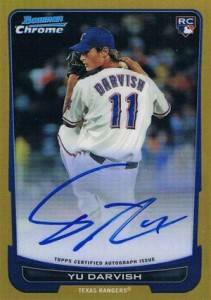 Other Darvish cards to make the top-sellers list include an unsigned Red Border 1/1 ($1,370) and a regular Bowman Chrome autographed rookie card ($950). 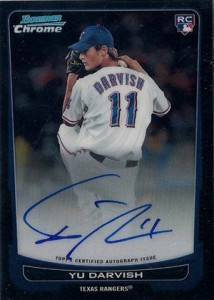 While Darvish's dominance isn't a surprise, the lack of Bryce Harper cards on the list is. A big part of the reason is that the Nationals rookie doesn't have many autographs in 2012 Bowman Baseball. His most readily available autographs in the set are retail exclusives. They also appear to be very limited. Both Harper autographs available in hobby boxes (Bowman Black and Lucky Redemption) are redemptions. The best option for Bowman Bryce Harper autographs are in 2011 releases. It is worth noting that the first 2012 Bowman Golden Contract has seen exceptional bidding. With more than a day left, it's currently sitting at $2,950. The box topper guarantees the owner a Yu Darvish autographed baseball. More exciting is the 1:10 chance of landing their own card in a 2012 Bowman product.